February: We supported BlazeSports. Their goal is to help others gain confidence and independence through adaptive sports. We've witnessed their direct impact on the lives of a family we know. We will be donating $125 plus a matching gift to BlazeSports through their online link at www.blazesports.org. A friend of ours in the D.C. area suggested we choose Stillbrave for our monthly project. She has volunteered at several of their events and had nothing but good things to say out their work and their founder, Tattoo Tom. From their website: Stillbrave’s mission is to provide non-medical, supportive care to children with cancer, and their families. They are committed to helping the families of children battling cancer in any way we can. So while they are fighting the toughest war of their lives, Stillbrave will fight their lesser battles, so they don't have to. Stillbrave not only here to support children with cancer; we are here to help ease the burden of the family and the caregivers who are fighting battles of their own. Tattoo Tom lost his daughter to childhood cancer and has made it his life's mission to help give children and families strength and support during difficult times. Stillbrave has several projects underway, one of which is preparing backpacks for children to help make their chemo sessions more comfortable and less scary. 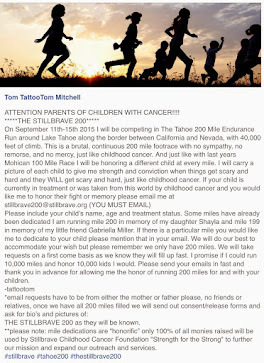 Tom will be running a 200 mile ultra-marathon in September; dedicating each mile to a child whom is undergoing treatment, or whom has lost their battle. There is a video on their website documenting his 100 mile ultra last year. His commitment to these children really comes through in the video. Check out their Facebook page for more stories. Use the yellow button below to go to Stillbrave's donation page and be sure to watch the moving short documentary about Tom's first 100 Mile Ultra posted below.